I have put a call out to some talented interior designers to share some of their best kids rooms with us for design inspiration. Each space is different and each child’s personality is different so it is fun to see some of the great kids rooms that result. Here are 20+ fabulous kids rooms for design inspiration and I will keep adding to the list as I come across inspiring design for kids rooms. Photo credit for this modern aqua kids room goes to Resource Furniture. 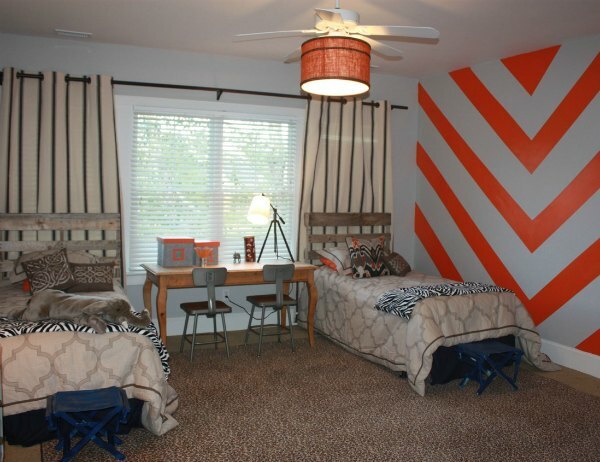 This kids bedroom features a custom designed Altea Sofa bed system by Clei, available from Resource Furniture. Designed for everyday use, it provides a perfect reading nook during the day and can easily be pulled down at night. Large closets offer a great spot to store the detachable bunk bed ladder to save space. Large bright windows, clean lines, and fun bright color patterns work together to create a fun space for kids. Anjie Cho specializes in holistic spaces integrating spirituality and green design for harmonious living and work spaces that resonate from both the inside and out to create healthy and conscious lives. 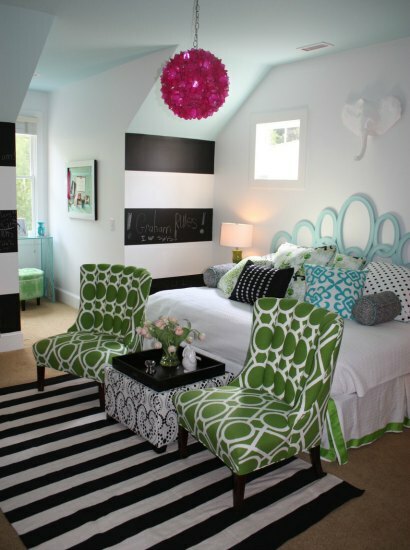 Here she has utilized Feng Shui and pulled together the girl’s favorite colors and selected fabrics. The drapes, duvet cover, and pillows were custom made. They also created a space to highlight the girl’s trophies and medals. This little boys’ room is for twins. The accent wall is hand-painted and adds a fun element that will grow with them. The upcycled palette headboards give it an industrial vibe. The desk does double duty and the leopard rug brings in another texture and pattern. The dated light on the fan was traded out for a burlap drum shade to update the look. This little girl/tween room has a chalkboard wall and is opposite Graham and Brown wallpaper so she can hang her favorite artwork. A desk is tucked into the alcove. The room has a Palm Beach Regency vibe, yet is grounded with black and white. Very colorful and very fun. Pink chandeleir offers the perfect fun finish. 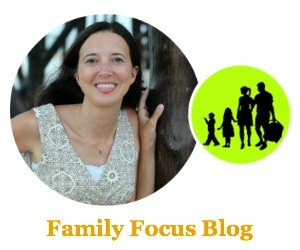 the child’s family history and his personality. 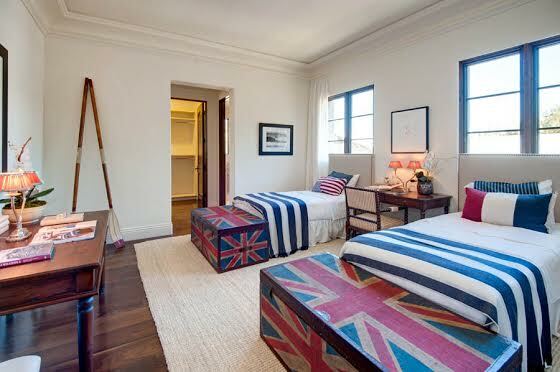 There are many vintage elements in this vintage boys bedroom that capture imagination. The large vintage letters that spell Sam’s name were all picked up individually at different times in different places. There is also a vintage, mid century Boomerang Chair with a union Jack Pillow, as well as bright yellow upholstered vintage stool that gets moved around when friends come to play. These vintage elements are sophisticated and practical. They are modern classics that will take Sam through his teenage and college years. There is an upholstered headboard that is in a stylish vintage and green color that matches the chair. A shearling rug bought at Shabby Chic beckons one to come play on the floor. The sophisticated cut out bedside table from West Elm works next to the retro looking Ikea floor lamp. This kids room is certainly for a little lady. I love the beautiful yellow bedding by Crane & Canopy and the she made the Silhouette Pillow herself. The hearts on the walls were done using stickers! I like the contrasting striped rug and I love the adorable bow window treatments. You will want to visit the Hunted Interior for a close of those. 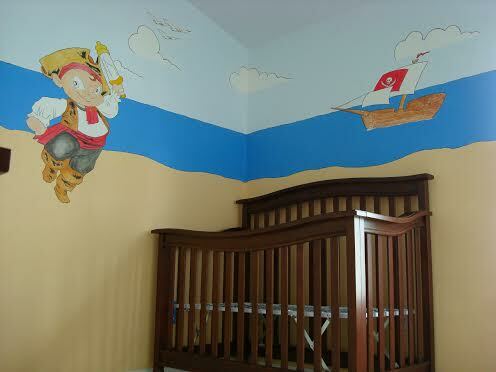 These hand painted pirate murals were done a daddy blogger and I love his creativity. Very fun! This stylish child’s room was shared with me by Interior Canvas. 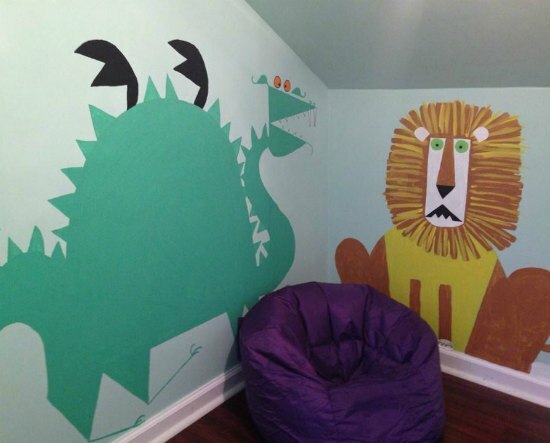 It is from a post about how to make a child’s room last with decor that can grow with the child. This bedroom has a very warm friendly feel but you can see how the room with easily grow with the child by simply changing out the artwork and toning down the toys. I love these hand painted murals and I the cozy bean bag lounger is great for curling up and reading a book. Meridith took her cue from the blue window frames and then had some fun with red/white/blue for a nod to America and her Mother England. The desk adds a British colonial feel to the room and the natural jute rug pulls it all together. 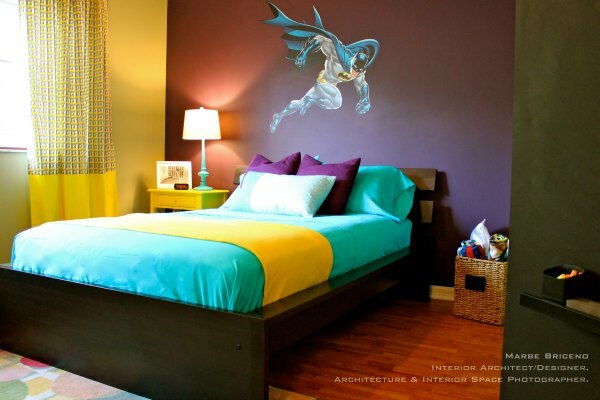 This fun Batman themed room was designed with a mini superhero in mind. She brought her ideas to life with a very tiny budget restoring some of the existing furniture. She added fun colors as well as functional elements and incorporated the Batman Superhero as a focal point. The perfect room for the 5-year-old client. 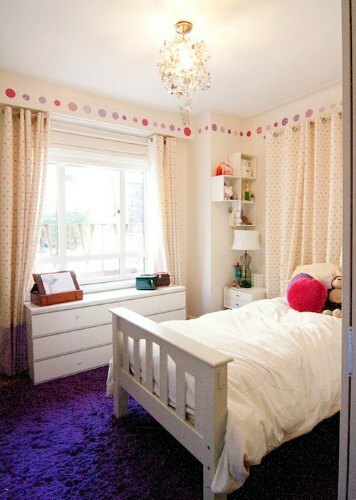 This tween girl’s room satisfied both mother and daughter by combining the daughter’s love of purple and mother’s need for outlasting color trends as she becomes a young adult. 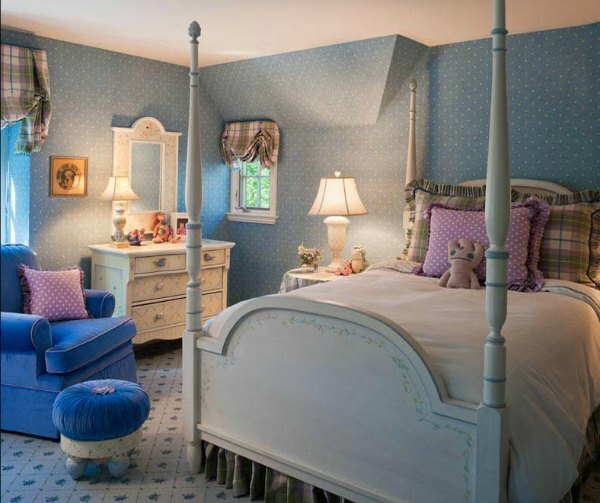 The room features furniture from Jane Keltner designs with a custom floral and leaf motif that can be repainted any number of ways later in life to take on a more adult role. A comfy chair upholstered in a durable blue velvet provides a reading nook and the inexpensive Thibault wallpaper helps to minimize the odd ceiling angles throughout the room. The wool carpet by Karastan is patterned enough to hide stains but light enough to keep the “pretty”, and is long lasting. All elements create a great mix to please mother and child. You may also enjoy this Lego boys room, and a dual purpose nursery and guest room. Get more ideas by browsing my kids rooms pinterest board. So which kids room is your favorite? 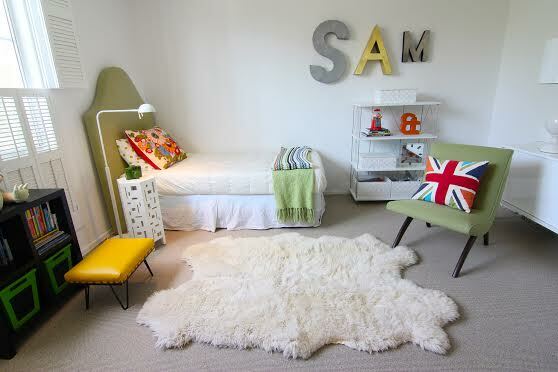 Which kids room design elements inspire you? My favorite room is the top photo, I love the teal colors. When decorating your child’s room, always keep in mind that they will grow up and will change their mind. Adding paint every year or two can get rather expensive, so choose colors that will grow with your child. 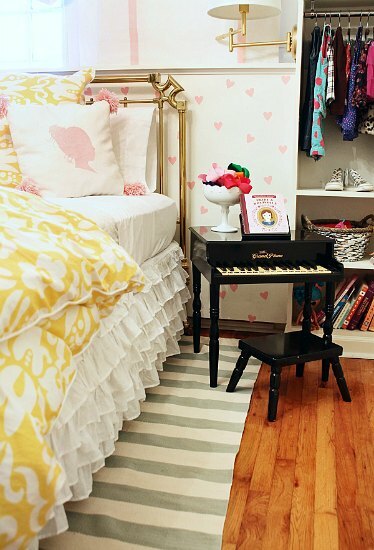 Changing bedding and curtains is the cheapest way to give your child’s room an instant makeover without overdoing it. Great selection of different rooms! I’d love to see a cohesive bedroom where 2 twin beds aren’t perfectly matched. I have 2 boys who share a room, but they’re 3 years apart in age and don’t want to match one another! I’m working on figuring out how to meet their desires and mine to culminate in a room that looks intentional & eclectic but not chaotic! Thanks. 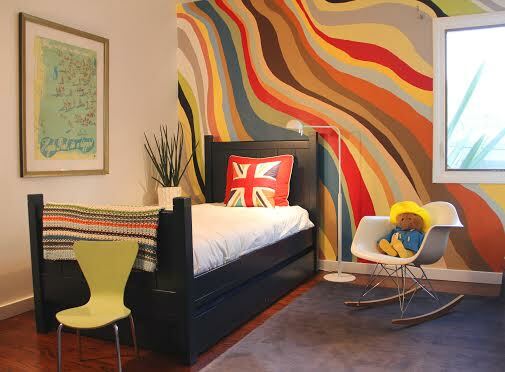 I loved The Batman Kids room because the designer to combine the colors of a fabulous way, versatile and economic, have a male child, and that design has inspired me to dare make a change to my son’s room.